SAN JOSE, Calif.--(BUSINESS WIRE)--Insert under the "Cutting Edge Customer Solutions" section of the release issued January 3, 2018, at 5:00am ET, as the second bullet point: "DIBOTICS, a pioneer in real-time LiDAR processing (SLAM on Chip), will showcase the latest features of its Augmented LiDAR technology using VLP-16, VLP-32, and HDL-32C sensors: precise Localisation and Ego-motion without requiring IMU, Live 3D Mapping, Point-wise Classification, Object Detection and Tracking, and "Calibration-less" Multi-LiDAR Fusion." Velodyne LiDAR, the world leader in 3D vision systems for autonomous vehicles, today announced an expansive presence at CES 2018, January 9-12 in Las Vegas. Demonstrations of the LiDAR sensors that have powered the first wave of autonomous vehicles will be featured in Velodyne's booth #3525 in the North Hall of the Las Vegas Convention Center. Key customers leading the global movement towards driverless cars and developing new use cases for advanced LiDAR technology will also have a presence in Velodyne's space. In addition, Velodyne will highlight news, key products, and customer achievements during an in-booth press conference on Tuesday, January 9, at 3:30 pm PST. "We expect 2018 to be a watershed year for both Velodyne and the industry, laying the foundation for autonomous vehicle deployments around the world in just a few years," said Mike Jellen, president and chief commercial officer, Velodyne LiDAR. "At CES 2018, Velodyne will showcase the LiDAR that will be seen on the first wave of autonomous vehicles, as well as new LiDAR use cases that take advantage of Velodyne's high-resolution, long-range sensors." 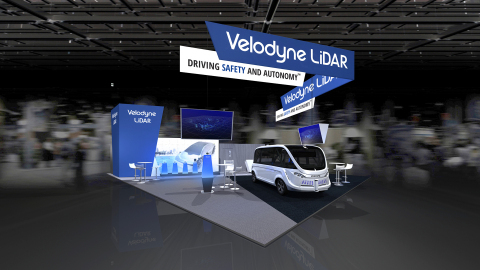 Taking center stage in Velodyne's booth will be demonstrations of new LiDAR sensors that expand the use case for autonomous vehicles, allowing for rapid mass deployment and increased testing in new environments. Velodyne VLS-128: Velodyne's recently announced VLS-128™, with its industry-leading 128 laser channels and best-in-class sensing for autonomous vehicles, will showcase the trifecta of long-range, high-resolution, and the widest surround field-of-view. It's the only sensor that allows autonomous vehicles to function just as well at highway speeds as low-speed urban environments. Velodyne Velarray: Enabling hidden sensing for today's driven vehicles, the solid-state Consumer Grade™ Velarray™ features an industry-leading 3D field of view in a form factor that can be concealed behind windshields and in roof lines and bumpers. It's a cost effective, high performance, and rugged LiDAR sensor in a small form factor, designed to be suitable for a range of ADAS and autonomous applications. 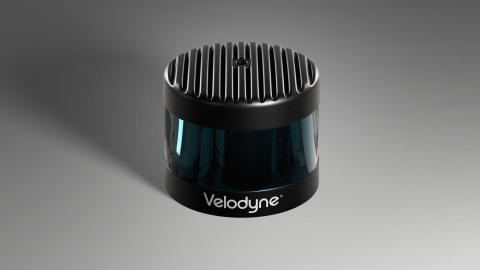 Velodyne VLP-16: One of the most widely adopted LiDAR sensors ever made has received a 50 percent price reduction, allowing for its continued expansion into a wide variety of industries, including automotive, freight, industrial, robotics, and more. The new pricing is a direct result of large-scale manufacturing at Velodyne's Megafactory, which leverages advanced automation to build a range of LiDAR sensors. "We have customers that demand the best perception systems for their fully autonomous vehicle programs, and the VLS-128 delivers. Other customers seek ADAS L2+ functionality from our consumer-grade Velarray LiDAR, which provides the power of Velodyne perception in a format perfect for vehicles today. These leading-edge sensors, along with Velodyne's broader product portfolio and over 500 employees across five offices, highlight our unmatched scale in real-time 3D LiDAR research, development, and manufacturing," added Jellen. 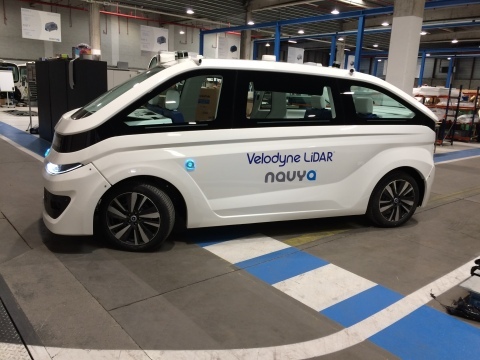 NAVYA's AUTONOM CAB, the first fully autonomous taxi on the market, will be shown for the first time in the United States in Velodyne's booth. Able to carry 1-6 passengers, AUTONOM CAB revolutionizes mobility in cities worldwide by providing an intelligent transport service for individual trips in urban centers, while placing an emphasis on interactions and comfort. It is equipped with one of the most advanced sensor architectures on the market, with no fewer than 10 LiDAR sensors, six cameras, and four radar units. The NAVYA team can also be found at Tech East – Gold Lot – North Plaza NP-9. DIBOTICS, a pioneer in real-time LiDAR processing (SLAM on Chip), will showcase the latest features of its Augmented LiDAR technology using VLP-16, VLP-32, and HDL-32C sensors: precise Localisation and Ego-motion without requiring IMU, Live 3D Mapping, Point-wise Classification, Object Detection and Tracking, and "Calibration-less" Multi-LiDAR Fusion. AGC – a world-leading supplier of flat, automotive and display glass, chemicals, and other high-tech materials and components – will showcase windshield technology from its new WIDEYE task force, which is focused on autonomous vehicles. Combined with the Velarray sensor for an interactive demo in Velodyne's booth, WIDEYE's infrared transparent automotive glass provides an ADAS and autonomous solution that's fully protected and totally hidden inside the vehicle cabin. DeepMap will showcase its high-definition (HD) mapping and localization platform for autonomous vehicles in Velodyne's booth. The company's maps empower autonomous vehicles with a precise understanding of their 3D environment, enabling safer and more reliable transportation. Paracosm President Amir Rubin will showcase the integration of Velodyne's VLP-16 Puck sensor into PX-80, a handheld 3D scanner that captures three-dimensional documentation of large-scale indoor and outdoor spaces in minutes. Mapper has created a globally scalable ecosystem for on-demand creation, validation, and maintenance of centimeter-accurate 3D Machine Readable (MR) maps, which will be shown in Velodyne's booth. Mapper acquires map data themselves, with a 100 percent coverage guarantee on public roads and delivers daily-updated maps to customers at a fraction of the cost of other methods without requiring any data back. Velodyne's press conference will take place in Booth #3525 in the North Hall on Tuesday, January 9, at 3:30 pm PST. Space is limited, so please email pr@velodyne.com to RSVP. For more on Velodyne LiDAR at CES and to download press releases, photos and videos, visit www.velodynelidar.com. To schedule a product demo for VLS-128 or Velarray, email pr@velodyne.com. Founded in 1983 and headquartered in Silicon Valley, Velodyne is a technology company known worldwide for its real-time 3D LiDAR computing and software platforms. The company evolved after founder/inventor David Hall developed the HDL-64 Solid-State Hybrid LiDAR sensor in 2005. Since then, Velodyne LiDAR Inc. emerged as the unmatched market leader of real-time 3D vision systems used in a variety of commercial applications including autonomous vehicles, vehicle safety systems, mobile mapping, aerial mapping, and security. Its products range from the high-performance, surround view Ultra-Puck™ VLP-32, classic HDL-32/64 and cost-effective VLP-16, to the upcoming, hidden Velarray™. Velodyne's rich suite of perception software and algorithms are the key enablers of its perception systems. Velodyne supports customers from offices in San Jose, Detroit, Frankfurt, and Beijing. For more information, visit http://www.velodynelidar.com. Velodyne showcases the next-generation of LiDAR sensors at CES 2018, alongside use cases from industry-leading customers.